A vegan rally against the society-wide exploitation of animals took place in Melbourne’s CBD on 8 April. And it captured the essence of what a protest is supposed to be about. It was unannounced. It surprised people. It caused delays and inconvenience. And thus, it got its message across. 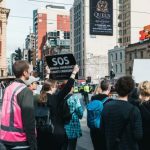 The close to one hundred peaceful activists that brought a halt to Monday morning peak hour traffic at the city’s busiest intersection – Flinders and Swanston – weren’t the only vegans protesting, as there were nine actions staged across the country. Early morning demonstrations that involved protesters chaining themselves to machinery took place at abattoirs in the Queensland town of Yangan, Goulburn in NSW and Melbourne’s Laverton. The campaign marked the one year anniversary of anti-factory farming documentary Dominion. And “these green-collared criminals” sparked the ire of Morrison and his cronies. The PM said under the unlikely circumstances that he’s re-elected, he’ll enact laws to prevent vegans from inciting criminal activities against those who harm animals, with the threat of 12 months imprisonment. This reaction led many to point out that right now the Liberal Nationals government is cracking down harder on vegans than it is on Nazis. Indeed, it’s done little to curb anti-Muslim sentiment bubbling up from these so-called patriots, rather it’s even attempted to weaken protective laws. Animal rights organisation Aussie Farms was one of eight that collaborated in the nonviolent 400 people strong vegan actions, which were aimed at drawing attention to “the inherent cruelty and total lack of transparency” in the local farming and slaughterhouse industry. Delforce directed Dominion, which, as he put it, “comprehensively explores the ways animals are raised and slaughtered in Australia’s animal agriculture industry”. And it has a focus on “the legal, standard practices” that permit “industry-wide cruelty”. The exposé filmmaker lists the following atrocities: gassing pigs to death, the blending of day-old chickens, slaughtering five-day-old calves, “mutilations performed without any pain relief” and the horror that “accompanies every farmed animal’s trip to the kill floor”. 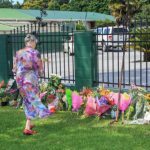 “Scott Morrison has labelled these peaceful protests as ‘un-Australian’, in notable contradiction to the Australian qualities of kindness, compassion and honesty,” Mr Delforce continued. And he noted the PM has made no mention “of the abhorrent systemic cruelty” that has been exposed. Rather, as Delforce explains, the Liberal leader has actually offered grants to businesses to pursue lawsuits against activists like himself. And now, with the support of the attorney general and the agricultural minister, Morrison is pushing for tougher laws. According to the filmmaker, there’s a nationwide crackdown on vegan activists. In WA, homes have been raided and possessions seized. And he pointed out that last week’s Melbourne protesters were threatened with five years prison, while others rallying at that same intersection haven’t been. 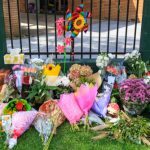 “The recent resurgence of violent right-wing extremism, by further contrast, has not seen any such condemnation or authoritative action,” Mr Delforce told Sydney Criminal Lawyers. And he further explained that the agricultural industry now describes activist actions as “terrorism”. 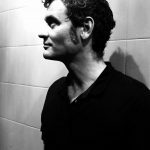 As far as online activist Andy Fleming is concerned, the reason behind the Coalition’s crackdown on vegans, whilst leaving the far-right alone, is its “alignment with the multi-billion dollar agricultural and farming industries”, and its commitment to protect them against disruption, “however minor”. 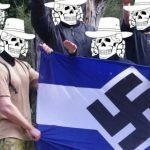 “Further, the trend towards criminalisation of such protest activity follows the US model, where animal rights and environmental activists have been under intense pressure from the state,” said Fleming, who documents the activities of local right-wing groups as blogger slackbastard. 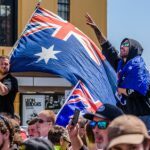 So, what Mr Fleming is explaining is that the Abbott/Turnbull/Morrison government has not found it necessary to take a substantial stand against groups, such as Reclaim Australia and the Antipodean Resistance, that incite hatred against Muslims and refugees, as it doesn’t serve their purposes. While in March 2017, the Senate knocked back Turnbull government legislation resulting from that debate that aimed to amend section 18C of the Act, so that it would have been legal to offend, insult or intimidate others on the basis of their race. Fleming also pointed to an incident in the Senate last October that saw all Liberal and Nationals members “accidentally” vote in support of a Hanson-introduced motion that declared “it’s OK to be white”: a well-known white supremacist catchphrase. “Rather than act to curb these expressions, there’s a good case to be made that the government has instead pandered to them,” Mr Fleming made clear. And he explained that if it took measures against local white supremacists, the Coalition would stand to lose more votes to One Nation. Mr Delforce believes that the actions being taken against vegan protesters will not be limited to the animal rights movement. And this can be evidenced by recently enacted anti-protest laws at the federal level, as well as at the state level in NSW. And he understands the protest clampdown firsthand. In June 2015, a joint NSW and SA police taskforce raided his Adelaide home, following the release of his 2014 documentary Lucent. His case was later dismissed as the police couldn’t prove they had the correct authority to lay the charges. “Stifling and punishing views that are objectionable to key campaign donors absolutely limits the capacity and the right of Australians to have informed conversations about important and urgent issues,” Delforce concluded.